Many families in Massachusetts have felt the disastrous effects of the ongoing opioid crisis facing the nation. While every state has unique drug abuse issues, the problems facing Massachusetts seem to be getting worse, not better. Widespread drug dealing, easy access to heroin and a rash of fentanyl-laced heroin seizures have perpetuated the drug overdose problem in the state, leaving lawmakers struggling to find solutions. The drug problem in Massachusetts is multifaceted. The demand for opioids and heroin is extremely high across the state, so much so that drug dealers have extensive networks that funnel drugs into the state from neighboring states and other countries. Recently, a 10-month-long police effort led to the arrests of 30 individuals participating in an extensive heroin trafficking operation based in nearby Providence, Rhode Island, which affected Massachusetts. This bust is indicative of widespread drug trafficking across the country. The demand for heroin and fentanyl is so high that some drug dealers are going so far as trying and produce fentanyl themselves. Fentanyl is a synthetic opioid that is up to 100 times more potent than heroin. A fatal dose of fentanyl is only a small fraction of the size of a fatal dose of heroin. Drug dealers have started using fentanyl as an additive in their heroin because a small amount dramatically increases the potency. On May 25, 2017, federal agents seized more than 50 kilograms of a compound known as NPP, which is used to synthesize fentanyl, from a Northborough storage facility. The amount seized would have been enough to produce $570 million worth of fentanyl based on current street value. Most fentanyl seized in the U.S. can be traced back to other countries, particularly China, but law enforcement officials say that the appearance of stateside fentanyl production operations is both disturbing and a sign of an extremely high demand. Drug dealers, seeing the potential for even higher-than-usual profits, appear to be willing to risk production on their own to effectively cut out the middleman and cash in on Massachusetts’ opioid dependency. Using simple testing strips, drug users can test a dose before consuming it to ensure it does not contain fentanyl. If the dose test positive for fentanyl, the user will know to take a much smaller dose and to avoid taking it alone. A group of former and current drug users formed an organization called the New England Drug Users Union to encourage those struggling with substance abuse to form better habits and use their drugs of choice safely. While these test strips do little to stop new addiction cases, they have prevented several deaths in Massachusetts. Advocates including the New England Drug Users Union understand how severe opioid addiction is for those who struggle with it, and rather than further stigmatize these individuals, they want to encourage safety and responsibility. Unfortunately, this measure is not going to do much to curb the growing number of addiction cases in Massachusetts. The drug business in Massachusetts may be extremely lucrative for illegal drug dealers, but the rest of the state is suffering tremendously from this crisis. Between 2000 and 2016, nearly 14,000 people died from opioid-related overdoses. 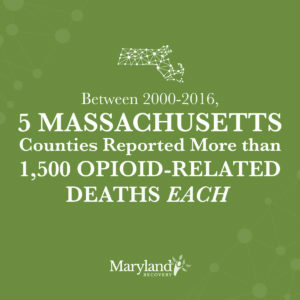 Although this problem affects the entirety of Massachusetts, several counties have seen far more deaths than others. During the aforementioned time period, more than 2,500 of the deaths reported took place in Middlesex County. One of the most salient effects of the opioid crisis in Massachusetts is the growing number of used needles appearing in parks, rivers, beaches and streets. Heroin addicts tend to congregate with each other to take their doses, usually because they must pool their money to secure their drugs, and it’s well-known that dosing alone is dangerous. Experiencing an overdose with no one around to offer aid is a common cause of opioid-related deaths. Discarded syringes pose public health issues. Sharing needles is one of the most common vectors for disease transmission, and many opioid addicts contract infectious diseases, including hepatitis and HIV. Syringes left in parks and other public areas are especially dangerous for children who may happen upon them and not only injure themselves, but contract these dangerous diseases as well. Where Does Massachusetts Go from Here? The outlook for the drug epidemic in Massachusetts and throughout New England appears bleak. State lawmakers are struggling to keep pace with the growing number of drug-related crimes, new addiction cases and strained substance abuse treatment programs. Finding effective substance abuse treatment is difficult for Massachusetts citizens struggling with drug addiction. Anyone in Massachusetts who is struggling with opioid addiction needs to recognize the widespread opioid problem in the area and the low availability of acceptable treatment programs nearby. The only real answer to addiction is seeking treatment as soon as possible. Furthermore, seeking treatment out of state will help many addicted individuals break free of the dangerous influences back home. 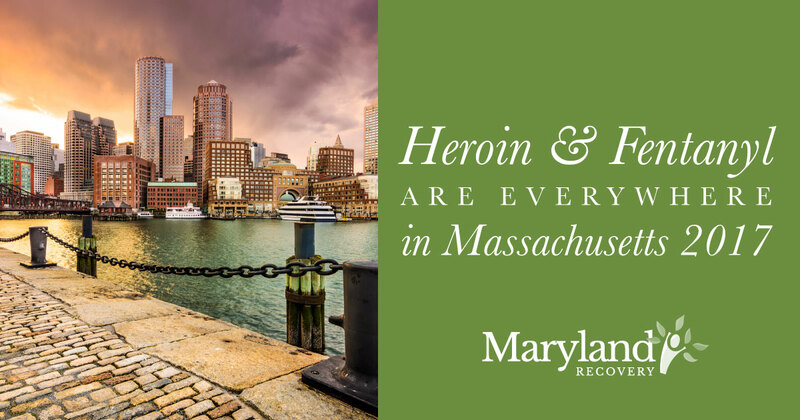 At Maryland Recovery, we understand the difficulties facing Massachusetts citizens who are in the grips of the opioid crisis. Consider your options for treatment and realize that being open to the idea of moving out of state for your recovery may be your best chance at overcoming addiction. Contact us today to see how we can craft a customized path to recovery for you or a loved one. This entry was posted in Addiction News, Prescription Drugs and tagged Facts And Stats, Heroin, Opioid Epidemic, Overdose Prevention on September 22, 2017 by mdrecovery.